On September 15, go to Atwaters Hopkins for lunch and they will donate 25 percent of their lunch revenue to Moveable Feast. Rather go out for dinner? 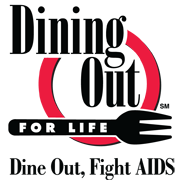 Check out www.diningoutforlife.com/Baltimore for a list of restaurants donating 25-100 percent of their proceeds to support Moveable Feast. Moveable Feast partners with Johns Hopkins Medicine to provide medically tailored home delivered meals to those living with HIV/AIDs, cancer, renal disease and other life threatening illnesses. Hopkins doctors, nurses and others will be at Atwaters and Woodberry Kitchen spreading the word about Moveable Feast’s mission. Check them out!